PhotoUpLink allows you to use your own FTP space, or any FTP space to store and forward items directly from iPhoto. This version of PhotoUpLink also introduces support for PhotoUpLink.Net, a service available only to users of PhotoUpLink to simplify transfers of hi-res images and video to multiple email recipients, eliminating email attachment size limits. Any FTP or SFTP site. The folder that will contain the images. It will be created if necessary, as long as the user logged in has the privileges required to create a folder, in the location specified. The password for the FTP or SFTP site. Note this is stored and sent as unencrypted, clear text, in all cases. Port number to use. If no port is specified, default SFTP and FTP port numbers are used. Images can be resized as the are put on the server. Only available for JPG files. Originals are not touched, a resized copy is sent to the server. 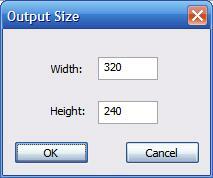 Check the box to perform the resize, press Resize to select the output size. Email is automatically generated containing links to FTP or HTTP accessible files that can be clicked on by the recipient. The .pul attachment when clicked on activates the Windows PhotoUplink Import, which then automatically imports the files into a new folder under My Pictures. This eliminates the need for large attachments of multiple files that may get rejected by mail servers and clog the recipient’s Inbox. 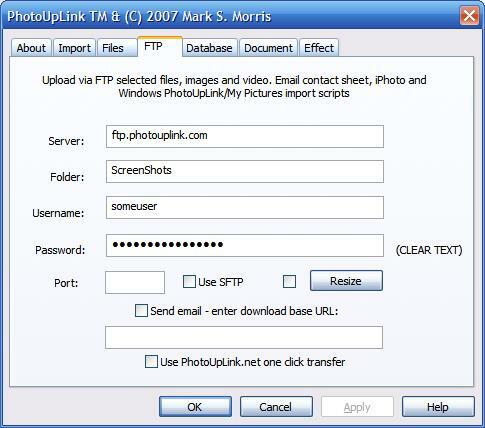 PhotoUpLink supports both HTTP and FTP importing, with or without user authentication. PhotoUpLink.net is introduced here for the first time in Windows PhotoUpLink, and will be supported in OS X and Pocket PC versions also. PhotoUplink.net is a public FTP server PhotoUpLink users can use to temporarily store images for collection by email recipients. This eliminates the need for hand assembling viewing URLs as described above. You will also be able to create galleries directly in future versions on PhotoUpLink.net. When you select PhotoUpLink.net option, other options will be disabled, they are now calculated for you. However you can still pick the folder name and the output size of the images and video. If this is the first time you have chosen the PhotoUpLink.net option, you will also be asked to agree to the terms and conditions of use, which can be reviewed here.